A well-known saying goes, “Man is known by the company he keeps.” We can apply this principle to our inner life for discerning the nature of our mind. Gita wisdom explains that we are different from our mind: we are eternal spiritual beings, whereas our mind is the liaison between us souls and our physical bodies. The mind’s nature is materialistic because it is filled with impressions from our past material indulgences. So it is by default attracted to material things. In contrast, we souls have the innate nature of loving Krishna and finding everlasting fulfillment thereof. To relish this fulfillment, we need to stop acting according to the mind’s nature and start acting according to our nature. In fact, the whole purpose of yoga is to purify the mind and harmonize its nature with our nature. Yoga often involves adoption of many external practices, so we may assume that adopting such practices ensures our spiritual growth and may not strive enough to purify our mind by fixing it on Krishna. 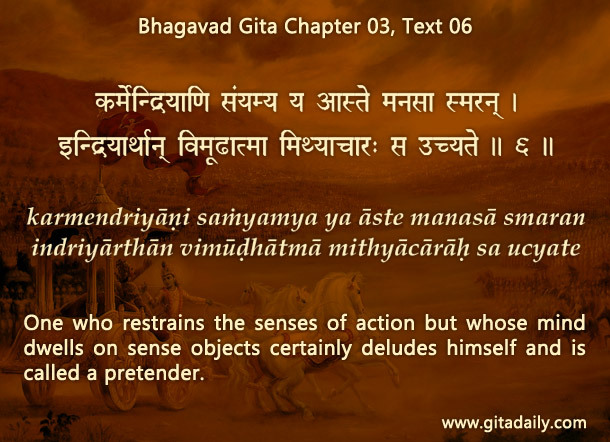 The Bhagavad-gita (03.06) cautions that those who renounce worldly things externally but dwell on them internally delude themselves. To properly discern our spiritual status, we need to monitor our mind’s default attractions. If we practice bhakti-yoga purposefully, we will regularly relish higher spiritual fulfillment by connecting with Krishna through his various manifestations such as holy names, Deities, scriptures and devotees. Such fulfilling experiences will gradually make the mind recognize that Krishna is a far better source of happiness than the worldly objects it craves for. Once this recognition sinks in, the mind will start looking forward to Krishna instead of worldly objects. When the mind’s longing thus becomes spiritualized, it will no longer remain our enemy, but will become our friend, pushing us to move straight and swift towards Krishna.